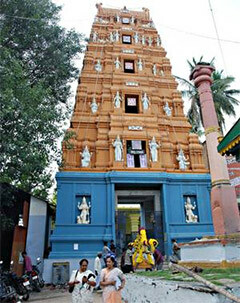 Hasanamba temple is a Hindu temple located in Hassan, Karnataka, dedicated to the Goddess Shakti or Amba. The temple was built in the 12th century and tourists are only allowed to visit the temple once a year during the Hindu festival Deepavali in October. Devotees visit the temple to seek blessings of the Goddess during this week. The temple is believed to have been constructed sometime around the 12th century, although the exact date is unknown. There is an ant-hill representing the presiding deity inside the temple premises and because the temple is open for only one week every year, it is considered special to obtain a darshan during the Deepavali festival. The temple is unusual in that it is open to the devotees only for a week every year. For the remainder of the year, the Goddess is left with a lit lamp, flowers, water and two bags of rice as offering until the next year. Arsikere is a town and taluka in the Hassan district in the state of Karnataka, India. 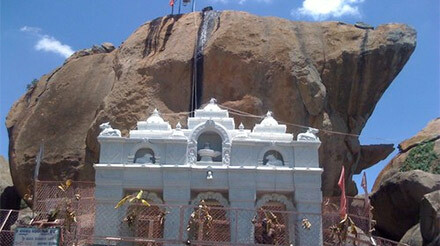 This area is known for its coconut production and the Malekallu Tirupathi hill. Arsikere is the taluka headquarters, a major railway junction on the South Western Railway which links Mangalore and Mysore to North Karnataka and a central place for tourists who visit nearby places that do not have rail access, such as Belur, Halebidu, and Shravanabelagola. The name Arasikere originates from one of the princesses of the Hoysala Dynasty, who built a lake (kere in Kannada) near the town. Arasi means queen in Kannada. Therefore, it is 'Arasiya+kere' which means "queen's pond". Arasikere was also called Udbhava Sarvajna Vijaya and Ballalapura at various times. Belur, is a Town Municipal Council and taluka in Hassan district in the state of Karnataka, India. The town is renowned for its Chennakeshava Temple, one of the finest examples of Hoysala workmanship. Belur was the early capital of the Hoysala Empire. 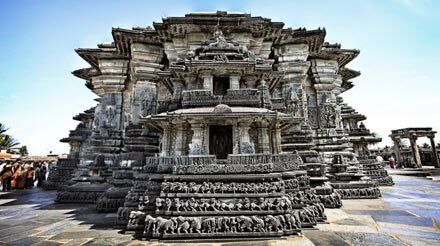 Belur along with Halebidu about 16 km away are one of the major tourist destinations in Karnataka. Belur is located in Hassan district. According to inscriptions discovered here, it was also referred to as Velur or Velapuri. Halebidu is a town located in Hassan District, Karnataka, India. Halebidu was the regal capital of the Hoysala Empire in the 12th century. It is home to some of the best examples of Hoysala architecture. 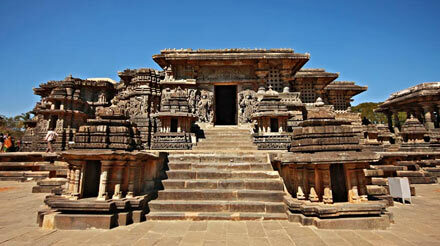 Most notable are the ornate Hoysaleshwara and Kedareshwara temples. The city got the name "Halebidu" because it was damaged and deserted into "old capital" after being ransacked and looted twice by north Indian Muslim armies of the Delhi Sultanate in the 14th-century. 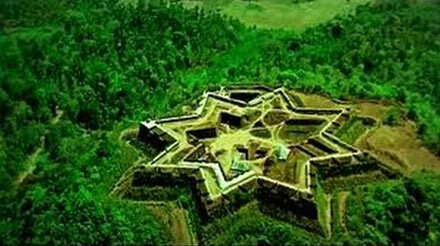 Manjarabad fort is a star fort built in 1792 by Tipu Sultan the then ruler of Mysore on the pattern of the military forts developed by the French architect Sebastien Le Prestre de Vauban. It is in the Hassan district in the Indian state of Karnataka. The fort is located 10 kilometres away from the Sakaleshpura town to its south west, which is on the right bank of the Hemavati River, 23 miles (37 km) from Hassan on the National Highway no 48 that runs from Bangalore to Mangalore. Shravanabelagola is a town located near Channarayapatna of Hassan district in the Indian state of Karnataka and is 144 km from Bangalore, the capital of the state. 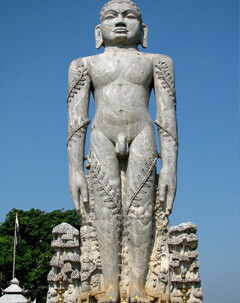 The Gommateshwara statue at Shravanabelagola is one of the most important tirthas (pilgrimage destinations) in Jainism, one that reached a peak in architectural and sculptural activity under the patronage of Western Ganga dynasty of Talakad. Chandragupta Maurya is said to have died here in 298 BCE after he became a Jain monk and assumed an ascetic life style. Shravanabelagola "White Pond of the Shravana" is named with reference to the colossal image of Gommaṭa - the prefix Śravaṇa serves to distinguish it from other Belagolas with the prefixes Hale- and Kodi-, while Beḷagoḷa "white pond" is an allusion to the pond in the middle of the town.